Its been a while since I’ve done a Raider report, to be honest its because we’ve sucked this year. Now I am a die hard raider fan so we can go 1-15 and I’m still going to pop my ish about the Silver and Black, But I kinda thought we were going to have a better season this year. While we doubled our win total from last year (we were 2-14). I was still expecting more. At least 8-8. Now with rumors of Warren Sapp’s retirement, Defensive Coordinator Rob Ryan being fired, Nnamdi Asomugha’s and Jerry Porters Pending Free agency, next year aint looking to promising. 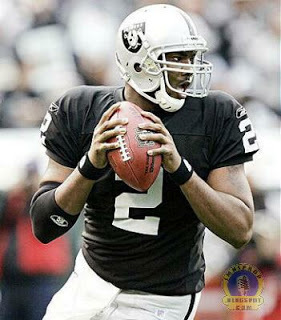 Well the good thing is Jamarcus Russell finally made his 1st start yesterday, and he looked good. His stats( 23/31 pass completions, 224 yards passing, 1 touchdown and 1 int) while not mind blowing, they were decent, and enough to give Raider nation some type of hope for next year. I figure with some time, a full training camp and preseason, if JR works hard in the offseason, and the raiders try to surround him with some good young talent, he can be a Pro-bowler. I would advise Coach Lane Kiffen to look at how the Cowboys of the ’90’s were constructed. Remember Troy Aikman’s rookie year they were 1-15. It wasnt until they added a young Halfback to carry the load (Emmitt Smith) and an exciting deep threat at receiver(Michael Irvin), that Troy showed his Hall of Fame talent. Now hopefully, we can find a way to keep Nnamdi (Franchise Tag) bring back Rob Ryan, and just replace who we lose with the draft. We could compete with the Patriots, Colts, Steelers and Jags next season. I have a trade idea that I hope happens. Trade Lamont Jordan to the Bears for WR Bernard Berrian. That would cushion the lost of Jerry Porter, and dump Lamont Jordan’s massive contract. I’m sure we would have to throw some draft picks in or something to compensate for Jordan’s contract, but i think it would be worth it. it would clear up the logjam at RB and we can start Dominic Rhodes. It would Also give us a deep threat that we deeply need since we got rid of the guy who plays in New England now. Now on the Bears side it would give the a Feature back, cause Cedric benson aint doing it. Also Lamont Jordan would thrive in the black and blue division since he is such a punishing back. hell a we’ll even throw in a QB, we got like 8 of them. So here’s to next season. Can we see 8-8 in ’08? if not I may have to quit football.